Make a wish, it's Tanabata! Tanabata, or the "Star Festival", is a Japanese festival that finds its roots in the Chinese Qixi Festival. As the legend goes, the Weaver Princess and Vega star, Orihime, daugther of Tentei, the Sky King, would wove beautiful clothes by the bank of the Heaven River, the Milky Way. Although her father loved the clothes she wove, she was desperately sad, for the hard work did not leave her any free time to meet anyone and fall in love. Moved by her concern, Tentei arranged for her to meet Hikoboshi, the Altair star, who worked on the other side of the Milky Way. Upon meeting each other, the two immediately fell in love and soon married. However, the married couple would now neglect their work: Orihime stopped weaving cloth for her father, and Hikoboshi let his cows stray all over Heaven. In anger, Tentei decided to separate the two lovers across the milky way, and prevent them from ever meeting again. But upon seeing his daughter's sorrow at the loss of her husband, and listening to her plea for them to meet again, he allowed them to meet on the 7th day of the 7th month, on the condition that she would finish weaving his cloth on time. It is said that on that day, a flock of magpies make a bridge with their wings to allow the lovers to cross the Milky Way. In old China, women would make a wish to Orihime: that she would allow them to become as talented as her at weaving cloth. As the tradition evolved, everyone now makes all kinds of wishes on July 7th! In Japan, people write their wishes down on colourful stripes of paper, before tying them to bamboo shoots. 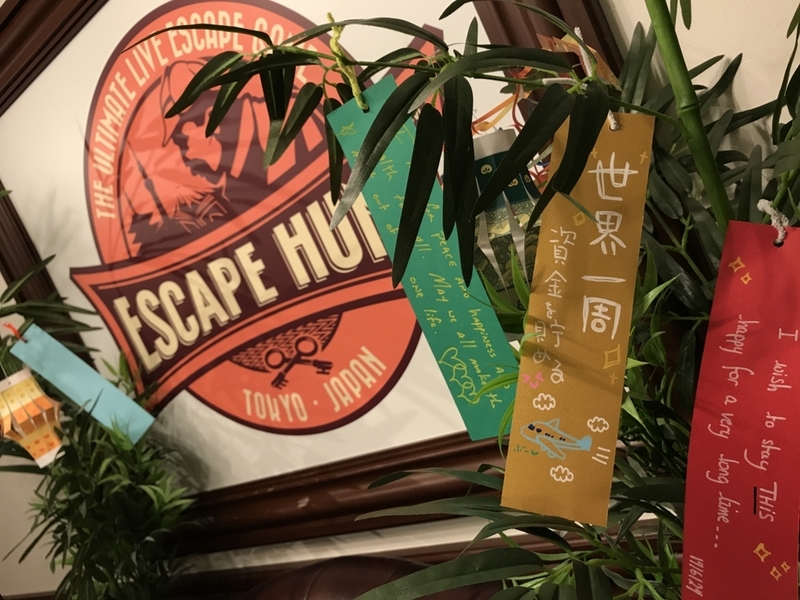 At Escape Hunt Tokyo, we have decorated our lounge with bamboo sprouts: we will give all our detectives their own colourful wish card so they, too, get to make a special wish and leave it between the bamboo leaves. Tell us, what will be your wish this year?